The building locates in the center of Daimyo area next to Tenjin which is the biggest commercial area of Kyushu. Many young people gather here and new cultures and trends are made by them. In the town's background, Josui Kuroda and Nagamasa Kuroda parent-child built Fukuoka castle and its castle town, and Daimyo lived here. With the times, stores are replaced and the building and the city has been changing always. We want to keep the old day's memories in this rapidly changing city, so we expressed its exteriors with irregularly-shaped stone walls of Fukuoka castle made of today's materials such as glasses and stainless. With that expression, which is remaking historical motifs by using today's materials, we propose new way in a relation of signs of commercial building and architectural exteriors. We placed showcases in whole surface of front exterior and at the same time, those showcases is the design concept of the building. Because of those showcases, its unity among the exteriors does not change when the stores replace. 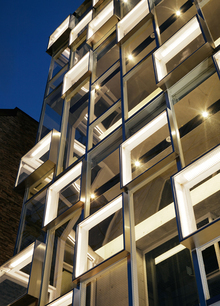 We designed it as open, blight and high transparent building to stand out even in busy street. Furthermore, we placed mirror surface stainless in the ceiling of road-side rooms. People walking in the road can see the inside situations by reflecting of that mirror surface. That reflection can attract people walking in the road, and also the architectural design and advertising effect can be improved by it. Copyright © 2018 - Shigeru Aoki Architect & Associates Inc. All Rights Reserved.